Often, in evangelistic series’ the question inevitably arises; “What is the meaning of “the blood and the water” as described in John 19:34? Time and time again I have seen the unfortunate speaker “fumble the ball” and give a weak answer or spiritualize the meaning away so that the true meaning of the text is lost. I hope that looking at this text through the eyes of a physician and not a theologian will help you to see it from a new angle and give a living meaning to the passage. Since our interest is theological, let us start with an exegesis of the text. But when they came to Jesus, and saw that he was dead already, they brake not his legs: But one of the soldiers with a spear pierced his side, and forthwith came there out blood and water (John 19:33-34). As we look at the passage in context (verse 33), we see that the actions of the Roman soldiers are in the context that Jesus was already dead. This gives us a clue as to the meaning. John nails this concept beyond question as to his meaning in verse 35. And he that saw it bare record, and his record is true: and he knoweth that he saith true, that ye might believe (John 19:35). Now you and I can easily miss this “detail” because we are not familiar with crucifixion and how it was really practiced and what the common procedures in carrying out this death sentence really were. But John is speaking to an audience who are all too familiar with this brutal practice. Crucifixion was the execution of a death sentence, and just like every execution, proof of death must be made. From how John writes, we can infer that the piercing of the side of the prisoner was well known to the people in the first century, and a gold standard test for death by crucifixion. Ellen White clearly supports this exegesis in the Desire of Ages. The priests and rulers were amazed to find that Christ was dead. Death by the cross was a lingering process; it was difficult to determine when life had ceased. It was an unheard-of thing for one to die within six hours of crucifixion. The priests wished to make sure of the death of Jesus, and at their suggestion a soldier thrust a spear into the Saviour’s side. From the wound thus made, there flowed two copious and distinct streams, one of blood the other of water. This was noted by all the beholders, and John states the occurrence very definitely. He says, “One of the soldiers with a spear pierced His side, and forthwith came there out blood and water. And he that saw it bare record, and his record is true: and he knoweth that he saith true, that ye might believe. For these things were done, that the scripture should be fulfilled, A bone of Him shall not be broken. And again another scripture saith, They shall look on Him whom they pierced.” John 19:34-37 (DA 771.4). After the resurrection, the priests and rulers circulated the report that Christ did not die upon the cross — that He merely fainted and was afterward revived. Another report affirmed that it was not a real body of flesh and bone, but the likeness of a body that was laid in the tomb. The action of the Roman soldiers disproves these falsehoods. They broke not His legs, because He was already dead, but to satisfy the priests, they pierced His side. Had not life been already extinct, this wound would have caused instant death (DA 772.1). But it was not the spear thrust, it was not the pain of the cross, that caused the death of Jesus. That cry, uttered “with a loud voice” (Matthew 27:50; Luke 23:46), at the moment of death, the stream of blood and water that flowed from His side, declared that He died of a broken heart. His heart was broken by mental anguish. He was slain by the sin of the world (DA 772.2). Now that we understand from the Bible and Spirit of Prophecy what John means when he talks about the blood and the water, let’s take a look at the statement in the light of modern medicine and. I will start with the gold standard definition of brain death. If it can be proved that blood flow to the brain has ceased for more than 5-10 minutes, brain death is certain. Does “the blood and the water” demonstrate this condition? Yes! Here is how it is demonstrated. If you take some blood and put it into a tube into which a chemical has been added to keep it from clotting, and allow it to stand upright, after some time passes, the red cells in the blood will settle to the bottom. 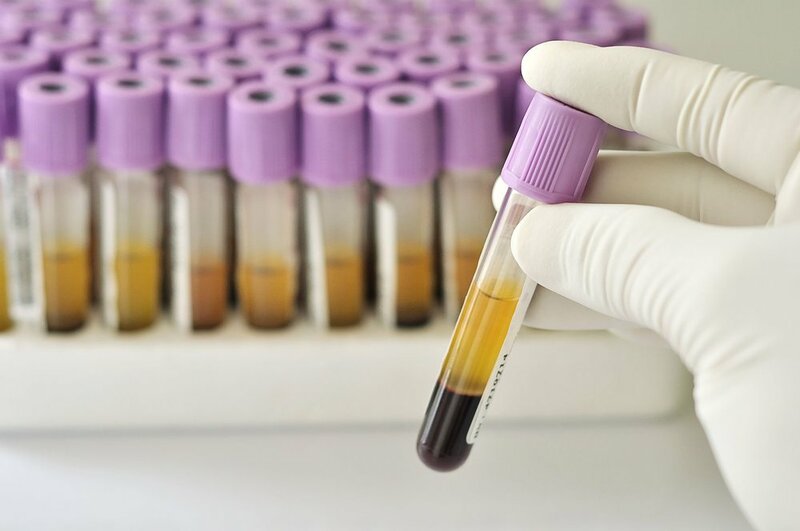 There is a laboratory test called a “sedimentation rate” which in fact measures the time which it takes blood to settle out. Usually it takes an hour to perform this test. If at any time the blood were to be shaken and mixed again, that would reset the sedimentation rate test back to zero and the sedimentation process would begin all over again. If one were to draw off fluid from the bottom of the tube of a completed sedimentation — the first to be released from the tube would be settled red blood cells. After all the red cells were taken out then the remaining blood plasma (or serosanguinous fluid” as its technical name is known) would then exit; blood and water! Now the prisoner being crucified is being held in an upright position during crucifixion and the lining of the blood vessels known as the endothelium keeps the blood from clotting. Therefore, about one hour after the heart of the prisoner has finished its final beat, if the bottom of the column of blood that is settled were to be tapped by a spear the settled red blood cell mass followed by the plasma would be seen. This test clearly demonstrates that the heart has stopped beating for more than an hour and circulation has completely stopped for that period of time thus clearly meeting the criteria for brain death and the clinical definition of death, the cessation of circulation. Even the layman will also understand this as certain death. There is only place in the body where a spear could consistently demonstrate whether the blood had settled or not. It would be to transect or pierce the great vessels (the aorta and inferior vena cava) where they bifurcate. This happens at the level of the 4th lumbar vertebra so it would be very easy to devise a test with a spear at this level. The spear would be inserted just above the iliac crest (the top of the pelvic bone in the side). This is the landmark to show the level of the disc between the 4th and 5th lumbar vertebrae (it is also where you would put your hands when you put your hands on your hips). The spear would be advanced until it touched the spinal column. Then it would be “walked” forward until it slipped off the front of the body of the vertebra. Then a quick thrust forward and immediate removal of the spear would pierce both the aorta and the inferior vena cava and the column of settled blood would drain out and the soldier would see “blood and water”. Ellen White is also correct by saying that such a procedure would cause instant death from bleeding if the prisoner were still alive as the he would immediately bleed to death. I believe that a spear in the chest as is pictured by modern artists would not be effective in predictably demonstrating the sedimentation of the blood as it would be very difficult to pierce the bottom of the heart and the volume of blood in the heart would be too small for a predictable test. Now what is the meaning of all this? John is giving us written eyewitness testimony to the death of Christ. The physical evidence which he presents — when properly understood — meets the gold standard for brain death from modern medical science. “The Bible is the best documented ancient manuscript with more copies than any other ancient source. There are more than 24,000 ancient portions or complete manuscripts of the Bible compared with the Iliad by Homer in second place with 643 copies with the first complete copy being form the 13th century.” (Leach, Charles. Our Bible and How We Got It. Chicago, Moody Press, 1898 p 145). Added to the Biblical evidence are references from Josephus and Tacitus; the two most academic historians of the contemporary period which corroborate John’s written eyewitness account. Now when it comes to the resurrection, there are a multitude of witnesses and facts which will give evidence as to the resurrection. First is that of the Roman Guard: Yes they were given a false report to spread around…that was “lame” as we say today. This report stipulates an empty tomb. The best way to contradict the “claim” of the resurrection would be to “produce the body.” The lying report admitted, the tomb is empty, we cannot produce the body. Next it has internal evidence that it was a lie. If the Roman Soldier was in fact asleep, how would he know that it was the disciples that stole Jesus body? If the guard was awake, why would they allow the disciples to steal the body? Furthermore, I am sure that this lying report was spread just to appease the priests, because after seeing an event that is so very extraordinary and supernatural, how could the soldiers keep quiet when they were no longer doing military service in Judea? I surmise that all of those soldiers questioned “who is this man?” Upon learning the story, a vast majority became believers. If you had seen the most extraordinary and supernatural event in the history of the world, could you keep quiet? “For I delivered unto you first of all that which I also received, how that Christ died for our sins according to the Scriptures; And that he was buried, and that he rose again the third day according to the scriptures: And that he was seen of Cephas, then of the twelve: After that, he was seen of above five hundred brethren at once; of whom the greater part remain unto this present, but some are fallen asleep. After that, he was seen of James; then of all the apostles. And last of all he was seen of me also, as of one born out of due time (1 Corinthians 15:3-8). This is a clear account of what happened and how many people saw Jesus after his resurrection. There were a lot of eyewitnesses to declare that Jesus was indeed raised from the dead. Another evidence of this is the rapid spread of the gospel during the time of the apostles. It had to be a known fact that Jesus had in fact risen from the dead for so many people contemporary with the historical event to accept it as true. But Thomas, one of the twelve, called Didymus, was not with them when Jesus came. The other disciples therefore said unto him, We have seen the Lord. But he said unto them, Except I shall see in his hands the print of the nails, and put my finger into the print of the nails, and thrust my hand into his side, I will not believe. And after eight days again his disciples were within, and Thomas with them: then came Jesus, the doors being shut, and stood in the midst, and said, Peace be unto you. Then saith he to Thomas, Reach hither thy finger, and behold my hands; and reach hither thy hand, and thrust it into my side: and be not faithless, but believing. And Thomas answered and said unto him, My Lord and my God. Jesus saith unto him, Thomas, because thou hast seen me, thou hast believed: blessed are they that have not seen, and yet have believed (John 20:24-29). Here we have written eyewitness testimony giving us physical evidence the Jesus Christ was indeed alive after the crucifixion and that he still bore the scars of the ordeal. Therefore, we can say unequivocally and incontrovertibly that the death and resurrection of Christ is the best documented historical account that exists from antiquity! Our faith rests on the very best historical evidence which exists, period! Only after this foundation of our faith is firmly established, can we go on to draw spiritual lessons from this cosmic event. Applications of forgiveness (blood) and cleansing (water) are appropriate spiritual lessons and are showed in the Sanctuary by the Altar of Sacrifice and the Laver in the courtyard. These lessons are not to be passed over. But these wonderful spiritual lessons are to be drawn only after the historical foundation of our faith has been clearly laid. For those of you who like to point out that Jesus died of a broken heart, let’s go back and look at that passage again so that there is no misunderstanding of what is being said. “But it was not the spear thrust, it was not the pain of the cross, that caused the death of Jesus. That cry, uttered “with a loud voice” (Matthew 27:50; Luke 23:46), at the moment of death, the stream of blood and water that flowed from His side, declared that He died of a broken heart. His heart was broken by mental anguish. He was slain by the sin of the world (DA 772.2). Notice that it was the cry uttered, AND the presence of the blood and the water which showed that he died of a broken heart. The blood and the water showed that he was dead, but the short time that it took him to die, and the cry show that “His heart was broken by mental anguish. He was slain by the sin of the world.” Death by asphyxiation, hypothermia, dehydration, or exposure, the common causes of death by crucifixion usually took several days. In Gethsemane, Christ fell dying to the ground according to Ellen White. This was clearly due to the weight of the sins of the world and the “sweating of blood” was a physical sign that Ellen White’s assertion is also correct. (When red blood cells extrude through the blood vessels and skin to become “sweat”, death is certain and immediate.) An angel had to come to “strengthen” Christ—to reverse the process and keep him alive. Christ’s cry “it is finished” timed at the moment of the evening sacrifice on Passover day shows that the Father separated Himself completely from Christ at that specially designed moment to draw man’s attention to the sacrifice, and that it was that separation which “broke the heart of Christ”. It was the stress of being separated from the Father by my sin which killed Christ. Praise God that we have not followed cunningly devised fables, but have eyewitness evidence on which to base our faith — further bolstered by that more sure word of prophecy! "In Him we have redemption through His blood, the forgiveness of sins, according to the riches of His grace which He made to abound toward us in all wisdom and prudence, having made known to us the mystery of His will, according to His good pleasure which He purposed in Himself" (Ephesians 1:7-9). Dr. Nelson graduated from Medical school at Loma Linda University. He is Certified by the American Board of Anesthesiology and the American Board of Pain Medicine. He lives with his lovely wife, Becky in the Dayton, Ohio area.